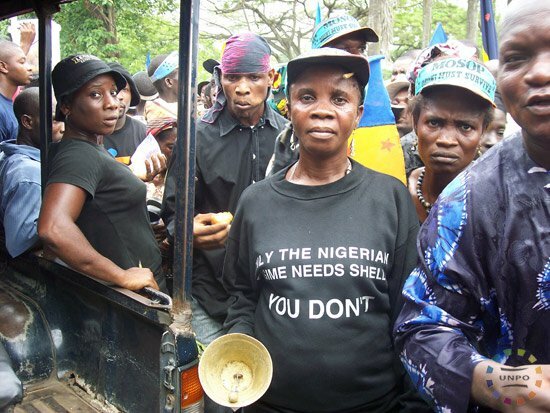 Three Ogoni women have reportedly been harassed by Shell Petroleum militia. The Nigerian government has yet to denounce the acts. In addition, after decades of continued environmental pollution in Ogoniland, the Nigerian government has agreed to allow Shell to install new pipelines in the region. MOSOP (the Movement for the Survival of the Ogoni People) calls on Nigeria to denounce the harassment of the Ogoni women and halt the laying of new pipelines. The Movement for the Survival of the Ogoni People (MOSOP) wishes to express its disapproval of the Nigerian government's silence on the cases of three Ogoni women harassed by soldiers attached to the Shell Petroleum Development Company of Nigeria Limited currently laying pipelines in Ogoniland. MOSOP is deeply concerned about the dangers posed to the security of local people and women in particular whose dignity are being trampled upon by Shell's presence in Ogoniland. We note that it is extremely painful and traumatic for the victims of these abuses and call on the Nigerian president, Muhammadu Buhari to halt further laying of pipelines by Shell in Ogoni until it is properly negotiated. Furthermore, we express our strong rejection of the planned laying of fresh pipelines from Eleme to Tekuru waterside in Bodo scheduled to commence later this month (August, 2018). Indeed, Shell's pipeline laying in Ogoniland has become a new instrument of dehumanization and we wish to strongly express our disappointment that Nigeria continues to tolerate an indecent Shell despite the atrocities of the company against the Ogoni people over the years and the refusal of the company to fund the cleanup of the Ogoni environment which it polluted in the course of its reckless and irresponsible business practices in Ogoni since 1958. MOSOP flays the stance of the authorities in Nigeria whose inaction against Shell is only encouraging impunity on the part of the company to further dehumanize our people. We demand full-scale investigations into the cases of harassment of our women to get the culprits brought to justice while we strongly call on the Nigerian government to call off Shell from Ogoniland immediately.